Before you decide that buying a brand spanking new DSLR automatically makes you the new James Cameron, there are a couple of limitations (of recording video on a DSLR) that you should take into consideration. The first limitation is apparently related to taxes imposed on a traditional camera versus a “video camera”. According to the straight laced, black suited people who are after a cut of the hard earned money of every person on the planet, a “video camera” is defined as a camera that is able to capture motion (video) for durations above 29 minutes and 59 seconds. Once your camera is able to record 30 minutes of video at a go, it (and all the packaging that it comes with) miraculously relabels itself as a video camera and as such is subject to higher taxes (in many countries worldwide) than the camera sitting next to it that is able to record an amazing 1 second of video less. Camera manufacturers, like any self respecting business under threat of higher taxes on some of their products, have since decided that imposing an artificial limitation of 29 minutes and 59 seconds, thus striking a blow at all that is evil in the world today. The second limitation is a limit of 4GB per file/video on your DSLR. This is thanks to the FAT32 filesystem, which was released sometime in the mid 90s, way back when a hard drive that had anything more than 1GB of storage was considered to be more at home in the offices of NASA or Industrial Light & Magic. Of course, back then, mentioning a file that was larger than 4GB in a crowd of geeks would give anyone nearby the impression that you were some earlier incarnation of Russell Peters. Back here in 2013, the vast majority of new computers are likely to be sold with upwards of 2TB (or 2000GB for the less geeky amongst us) of hard drive space. A typical high definition movie takes up anywhere from 6GB to 45GB of hard drive space. And FAT32, we thought, had been banished to dark halls of random computing museums. But no! FAT32 is still widely used by the majority of camera manufacturers as their filesystem of choice. Why? Apparently FAT32 is the most widely compatible filesystem today. Personally, I would have gone with NTFS, seeing as Microsoft still dominates the desktop OS market with something like 90% market share. On top of that, Mac OS X and Linux (which are 2nd and 3rd, combine to form just above 8%), are both capable of reading NTFS out of the box (and write to NTFS as well with minimal effort). A combination of the above two limitations will probably be a massive Boeing 747 sized thorn in the side of many considering a DSLR for video (semi pro or above) purposes. A recent foray on my end into DSLR video (which fortunately ended well), provides the following statistic; HD video (720p/1080p) will weigh in at an average of 300MB+ per minute. What this means, is that thanks to the FAT32 file size limit, you have a maximum of about 12 minutes of video at that resolution. Even if you were to drop the recording resolution to a pedestrian 480p (640×480), you end up with a maximum of 24 minutes. On the bright side, all of your current video length limitations are thanks to FAT32 and not the hard limit of 29 minutes and 59 seconds right? After all is said and done, the hard limit of 29:59 isn’t really a major factor for now. On the other hand, with most people expecting HD video these days, the 12 minute limit is something of an annoyance. Nobody is asking for the ability to film an entire 2 hour movie in a single take on a DSLR, but at the same time, 12 minutes is a rather short amount of time, even for something like an interview. While you could “pause” the interview for a second or two to hit the stop and record button on your DSLR, this option isn’t always available, and even when it is, that second or two is entirely capable of derailing the momentum of said interview. When the option isn’t available, those missing seconds of an interview will most likely result in much pain and suffering… for you (and this is assuming you are always at the camera and watching it like a hawk… let’s hope you aren’t standing at another camera when it hits the file size limit). At the end of the day, a DSLR isn’t really meant to be the go to piece of electronics for shooting video (at least not without significant expenditure on accessories). The microphone included on most DSLRs are proof of that. You will record audio in awesome stereo no doubt, but the quality of the audio will be questionable (and possibly not even audible) in anything short of pin drops silence. Even in pin drop silence, you’d need to drag your subject to within punching distance of the in built microphone… at which point you’d suddenly realize that you are going to need an incredibly wide angled lens in order to capture anything more than the subjects nose. Long story short, if you are planning on doing even semi-serious video with a DSLR, you are going to need to pick up a proper microphone (I ended up picking up a Rode VideoMic). 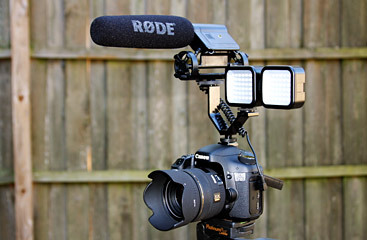 This is out of the question, unless you have an off body microphone that is a fair distance away from the DSLR itself. Canon users have a choice of two types of lenses (I’m not too sure about Nikon, but if you’re using a Nikon camera I’m sure you’d be able to research this yourself) – Micro Motor (MM) and Ultra Sonic Motor (USM). MM lenses tend to occupy the lower end of the price range, and their auto focus is driven by… wait for it… the Micro Motor!!! These lenses are far from silent, and attempting auto focus with a MM lens will likely result in a video that has strange audible clicks, pops, and loud whirring (even with an aftermarket microphone, and possibly even with an off body microphone). The higher end USM lenses are much, much more silent, but even then can typically be heard on the recorded video (off body mic users “may” be safe) unless there is significant background noise or the video is being shot in an outdoorsy or relatively loud environment. Audio problems aside, auto focus is still not a wise choice for video. The general population tends to think of auto focus as something magical that eases from being out of focus into focus gradually and in an artful manner. This cannot be farther from the truth. Imagine using your camera (DSLR, point and shoot, whatever) to auto focus on a subject, person, whatever. Try to recall what occurs while your camera is attempting to focus. Does “In, Out, In, Out, Blur, In Focus, Out of Focus, In Focus, Out of Focus, In Focus, Beep” sound vaguely familiar? Now, imagine repeating that process whenever your subject moves out of focus, and as the icing on the cake, apply the audible clicks, pops, and whirring noises from your MM/USM lens to your video in your imagination. Get the picture? On your DSLR, you will probably have a LCD viewfinder that is somewhere around the 3 inch mark. On the EOS 7D, the LCD viewfinder is 3 inches diagonally across, and has a resolution of 640×480. Now, with all of this in mind, how does one focus? Getting focus initially isn’t so much of an issue, since the 7D allows you to “zoom in” with the viewfinder to acquire initial focus, but once the video starts recording, you’re stuck with exactly what is being recorded. Result? Unless you have bionic eyes, you are going to be squinting… a lot. Solution? If you are serious about video recording on a DSLR, pick up an after market magnifying viewfinder with the eye cup thing. If the limitations aren’t much of a factor to you, if you are able to overcome the “problems” I’ve listed (by throwing money at accessories), then you’ll probably find DSLR video is actually pretty fun. By no means ideal, but considering these heavy, expensive, lumps of plastic and metal are actually meant for taking photos and not video, it is a pretty happy ending. This entry was posted in Uncategorized and tagged 7D, canon, dslr, EOS, video. Bookmark the permalink. Welcome Citizen Nighthawk BJ7019-62E to the Stable!!! Thank you… But how is panasonic able to achieve the above time limit in the lumix GH’s? A little reading points towards different versions of the camera (or firmware) depending on region. Some have the limit, others don’t. Looks like the GH series is just one of the fortunate ones where the manufacturer thought it was worth the time producing a firmware version that didn’t have the video time limitation.